Replace your laptop with a smartphone. Make it work functionally. So many apps have drop downs or buttons that don’t do anything at all. It’s mind boggling how these apps make it through the QA process. But if something looks like a button and doesn’t work like one, you’ve created a usability nightmare. Make it easy to use. A lot of apps have rich functionality buried underneath a complicated/convoluted multi-tier navigational structure, making it difficult to find the options necessary to interact with it in the way the user wants to. There’s been a lot of studies that the more you make someone click the less likely they are to find and click that option. So keep the interface clean, simple to use and easy to navigate. Don’t forget to pay attention to your workflows. Make it stable. I regularly run into unstable apps that crash when you do something like navigate away and then navigate back. That’s a terrible user experience. Your apps should be memory efficient, fault tolerant and if they do crash they should do so in the most graceful way possible. Make it save work if appropriate to do so. 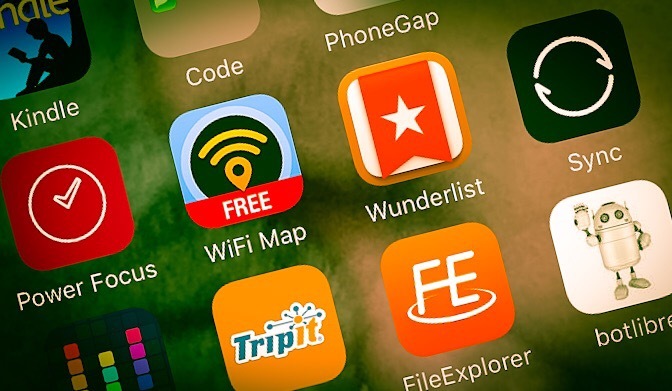 Some apps are safer to use because they save work as you go. Crashes are quite common on mobile, so this is a very useful feature if it’s appropriate to do so. Make it work with an external keyboard. Things like tab and shift-tab should work as expected – getting you from one form field to the next. If you have to take your hand off they keyboard to use your application you should probably re-think it, unless it is core to the app’s functionality (like a drawing program or something). Business users intuitively feel like touching the phone and interacting with it directly slows them down. Lack of a mouse really hurts app developers, but that’s a separate issue. Make it work equally well in landscape and portrait. So few apps do this well or even at all. Not even the settings app on iOS does this. Having to switch between the two just to use your app is annoying to say the least. You’re not a special snowflake and there’s almost never a reason to force the user into one mode over the other. Some apps like games need it to be in a certain orientation, fine, and no, I’m not talking about those. But your feature had better be worth it if you’re going to force the user to change the orientation of the device. Don’t play favorites though – just because you envision someone using the device in portrait mode, doesn’t mean that’s how they want to be using it. That’s especially true if they are using an external monitor. Give your app the same functionality as the browser version of your website. This should be straight forward, but almost no apps get this right. They often have no signup system, no payment system or a bunch of missing features. Why bother building an app if you aren’t allowing your customers to give you money? The worst is when websites force you to download an app and then don’t have the feature on the app. Are you trying to drive the customer away? Give an option to remove your ads, even if that means payment. It’s the most requested feature of most apps that have ads. Go ahead and do them a favor. Ads are not just annoying, they’re also a huge user of data, and mobile data plans aren’t cheap. Allow selectable muting and selectable alerts. A lot of the alerts that you think are important a user will disagree with you on. Meanwhile a lot of the things you couldn’t care less about a user will kill for. Making your alerts as selectable and customizable as possible is very helpful. As an example, making alerts specific to certain senders in emails would be very useful because some people have very important things to say, and many people have way too much email to get alerts about every inbound email. Selectable alerts is a winner. Keep push notifications to emergencies or important notifications only. Basically my rule of thumb when it comes to alerts is silence all of them unless they are warning of something involving a combination of the three I’s: impending, important and irreversible. If your alert is telling me about something I don’t care about you’ve made me that much closer to uninstalling your app or muting it permanently. Don’t waste the user’s time. Give the option to disable access to the location when not in use. Not only is accessing my location a battery hog, and a data hog it’s also just plain creepy. Ask for only the permissions you need. This should be obvious, but most of the time it appears it’s not. If you really want to be nice to your user only ask for it when you need it, rather than upfront. That way they can selectively disable it and re-enable it. Not many people are this paranoid, but when they are, this little detail can go a long way. Use SSL/TLS for everything possible. A lot of apps not only don’t use HTTPS but they don’t even tell the user that they aren’t. So there’s no way for them to even notice that something nefarious could be happening and is possible, unlike a web application with a browser where the protocol (http or https) is in the URI field. Create layered authentication if the app’s access includes sensitive information. For example banking apps shouldn’t allow users to check details without authenticating each time. The rule of thumb here is that theft of an unlocked phone should not mean complete loss of whatever data the app has access to if you build your app well. This really only applies to sensitive data, but it’s amazing how many apps have sensitive data these days. If you’ve discontinued the app in favor of another one, alert the user to that fact. I’ve run into a number of situations where the app appears to no longer work, but what really happened is that they stopped supporting that version and created a new version. Without telling the user, you’re really creating a terrible user experience. These rules of thumb are primarily related to business apps but I can see situations where many of these issues could be useful for any sort of mobile application. Let me know if you think I’ve missed anything.